Studying at NUAST sixth form is just a little bit different from the regular post-16 experience. 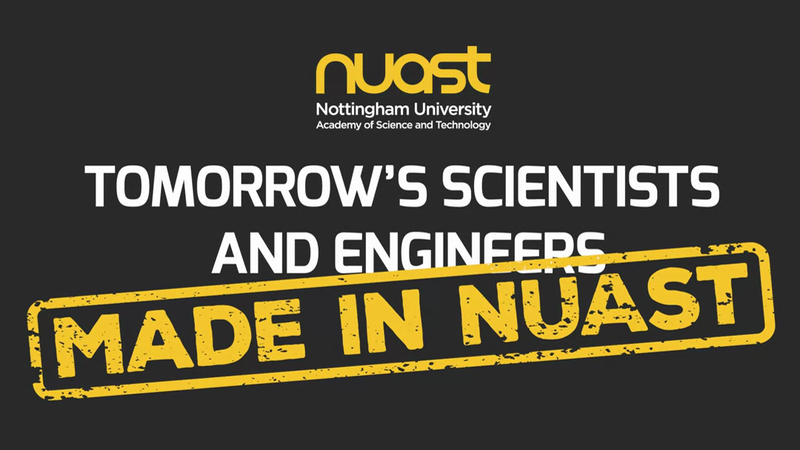 NUAST offers some of the very best facilities for Science, Engineering and ICT in Nottingham, because we believe that the young people of this county deserve the chance to excel in STEM subjects by accessing the very best equipment available. The fantastic building, facilities and equipment are only a small part of what NUAST has to offer. Specialist and expert teachers in every subject will instil in you the passion and commitment they feel for their subjects, while expertly leading you through the exam requirements and beyond. At NUAST, we believe in achievement, but we also believe that learning does not end with the requirements of the exam board. Our teachers will prepare you for a future career in industry by teaching the skills that employers want to see. Our small academy allows personalised learning that breeds dedication and will transform you into a professional student who any university or employer would be proud to take on. Our close links with both local universities, as well as local employers and national companies will ensure that you leave NUAST well connected with an exceptional awareness of how to succeed in your chosen field. With chronic skills shortages in computing and IT there has never been a better time to study these subjects. At NUAST you can study computing and IT as a specialist subject at GCSE and Post 16 level. At Post 16 you will have the chance to study a Cambridge Technical Extended Diploma in Information Technology. This innovative vocational course is delivered over 20 taught periods a week and is the equivalent of three A Levels. During the course you will study 18 units and be supported by industry partners providing you with a comprehensive grounding in the working practices of an IT professional. To further support your study and provide you with an opportunity to explore ideas beyond the curriculum, you will take the Level 3 Extended Project Qualification. The EPQ is a universally recognised additional qualification that allows students to explore a particular area of academic study that interests them. It is equivalent to half an AS Level. Engineering is a career rich in opportunities which can take you to any corner of the globe. At NUAST we provide the best engineering facilities and curriculum in the local area at GCSE and Post 16. At Post 16 NUAST offers the BTEC Level 3 National Extended Diploma in Engineering. Broken down into 18 units, this course is designed to give you a firm grounding in engineering principles through practical experience. Supported by our industry partners, you will be taught over 20 teaching sessions a week leading to a qualification equivalent to three A Levels. Whether at GCSE or A Level, NUAST offers each science as a discrete subject, providing students with the qualifications to gain access to leading universities nationally and internationally. As a Post 16 Science student at NUAST you will have access to outstanding facilities, specialist teaching staff and the support and guidance of a world-class university. At NUAST you can study the BTEC Level 3 National Extended Diploma in Applied Science. This course is intended as an Applied General qualification for Post 16 learners who want to continue their education through applied learning and who aim to progress to higher education courses. The qualification is wide-ranging and is equivalent to three full A Levels. It has been designed as a two-year, full-time programme of study. The EPQ is a universally-recognised additional qualification that allows you to explore a particular area of academic study that interests them. It is equivalent to half an AS Level. A Levels are available in Physics, Chemistry and Biology. These core sciences are complemented by a range of additional A Level subjects covering the STEM (Science, Technology, Engineering, Maths) curriculum. In addition to these subjects, you will undertake the Extended Project Qualification. The EPQ is a universally recognised additional qualification that allows students to explore a particular area of academic study that interests them. It is equivalent to half an AS Level.